" how do Japanese students evaluate & buy education? " " International education is a billion dollar industry, cultural understanding backed with market research is the key to success. Peter Hanami using qualitative research has undertaken a detailed analysis of the buyer behaviour of Japanese students in Australia. His study uncovered the unique buyer behaviour characteristics of Japanese students across four different education sectors. 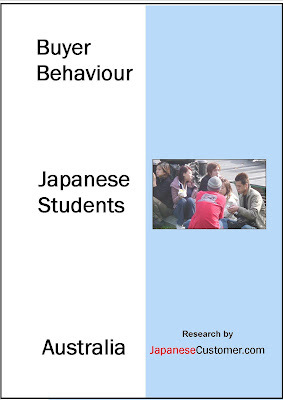 The findings will be of interest to those wanting to recruit, manage & retain Japanese international students as customers "
Qualitative market research detailing the buyer behaviour characteristics of Japanese international students in Australian education. ● Findings broken down by visa type. ● 37 charts & 35 references to current articles. American Marketing Association and the author of eight books on Japan. Japanese student experiences Australia, Japanese international student experiences Australia, Japanese student buyer behaviour, japanese student buyer behaviour australia, Japanese students studying abroad research, japanese student international education research, qualitative international education research japanese students, Japanese students, Japanese student market, japanese student recruitment research, japanese student management research, japanese student retention research,international education research japanese student market, marketing to Japanese students, holistic profiles of japanese students studying abroad, how do japanese students select international education abroad, japanese student research australia, communicating with Japanese customers, japanese students studying abroad, japanese student perceptions of studying english abroad, social inclusion of japanese students studying abroad, japanese international student management, english language study by japanese students, vocational japanese students, undergraduate japanese students, private language school japanese students, university Japanese students studying abroad, Peter Hanami, JapaneseCustomer.com, japanese student research australia, japanese student research, Japanese student profiles, japanese student profiles by education sector, japanese student buyer behaviour profiles by education sector, Japanese customer buyer behaviour of foreign education, japanese consumer behaviour international education, japanese customer decision making processes education, how japanese students select a study abroad course, marketing study abroad to japanese students, marketing services to japanese customers, attracting japanese students to study abroad programs, managing japanese students studying abroad, retaining japanese students studying abroad, japanese customer service, marketing to japanese customers abroad, marketing international education to japanese students, international education case study Japanese students, qualitative international education research japanese customers, qualitative international education research japanese students.